Why not have a Spring clean of your life and habitat, and make space so you can practise those Blogilates moves you’ve been learning? Do you have no freakin’ clue what this minimalist thing is? Let me show you! 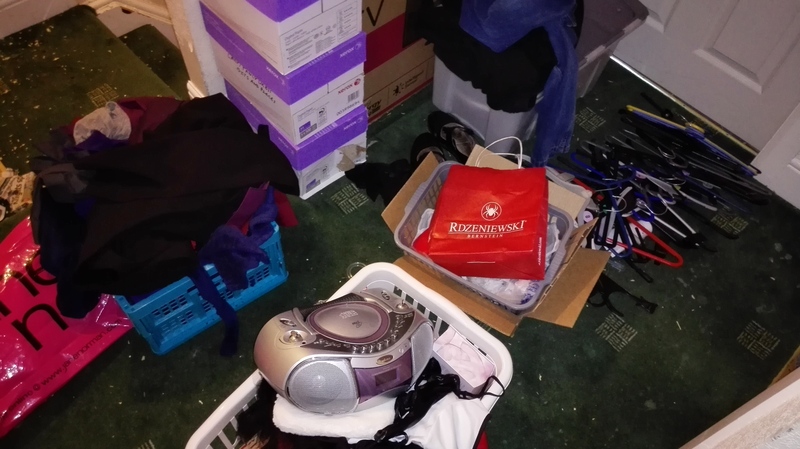 Read on to find out what it is, how to declutter your house, find some resources, then read my journey of discovery and see how bad my house was last week!! This isn’t minimalism. It’s consumerism. That’s the opposite of minimalism. The purpose of images such as this one is to get you to buy more stuff. Basically, the consumerists want you to buy their furniture, items, paint etc and get rid of all your old comfortable stuff, and they’re calling it minimalism but they’ve missed the point. Why? Because otherwise, how could they sell you more comfy squishy stuff in 2 years’ time? Minimalism is not about straight lines or monochrome colours. It’s not about “feature walls” or getting rid of floral prints, or any other type of consumerist style crap. It’s a philosophy. 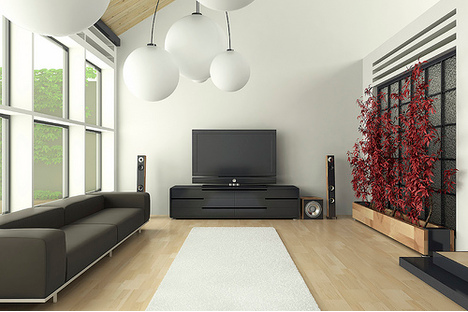 Minimalism is often presented as something you can buy from a Scandinavian furniture store. The truth is, all you’re buying is what has been termed “minimalist style” by fashion magazines. Comparing minimalism (the lifestyle) with minimalism (the photos of monochrome lounges) is like getting your bedroom designed to look like a pirate ship, then calling it a pirate ship. It’s still a bedroom, and if you put your pirate themed bedroom in the ocean, it would probably sink (unless you live on an actual boat). It’s a theme, and it’s different to the thing itself. That’s the same with minimalism. Note how there is still squishy comfy stuff and old well-loved stuff in the picture? Notice the lack of clean lines and monochrome media centre matching sofas? Minimalism is the act of getting rid of everything you don’t need in your life. When you think about it, this is diametrically opposed to going on a monochrome furniture shopping spree. You can’t buy minimalism because minimalism is the complete opposite to consumerism. Are you following? 1. Digitize: Scan your photos, digitize your music and video (there are plenty of online services such as Netflix that make the DVD redundant) and get a Kindle (or better still, get the FREE Kindle For PC app and download books from amazon.com). Then get rid of the physical copies. 2. 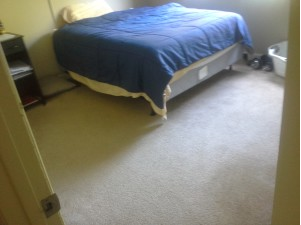 Get rid of anything you haven’t used for over a year, unless its purpose is very specific (e.g. scuba gear, ice skates), in which case give it three years (if you haven’t used it after 3 years, it’s probably not your hobby any more). Recently I got rid of my flute because I hadn’t used it for about 4 years. 3. Getting rid of batteries and envelopes is silly. You’re buying into consumerism because you will have to buy them again at some point. Getting rid of broken torches and that “solar battery charger” from 1998 that never worked in the first place, on the other hand, is sensible. 4. Detach the concept of “value” from how much you paid for it or how much it is worth now or how much it will be worth in the future. Value is a construct that is human-made and self-perpetuated. 5. When you buy something new, ask yourself if you really need it. If you answered yes, remove one item from your house. This is the one in – one out rule. 6. Start small – get rid of one item a day until you have less things. 7. Queue items to use – many people actually have loads of items in their home that they bought ages ago – and have never used! Make a note – a mental note or a paper note – of which items you’ve never used. If it’s a set of books, they are your next things to read (you might have to make an effort to read more); if it’s a saucepan, make your lunch or dinner in it today; if it’s a cosmetic, either try it out (and either keep or bin it) or intentionally leave it sealed and put it in the give-it-away pile. 8. Duplicates – where you’ve got two items that either are the same or do the same job, get rid of the second one. 9. Find things to do outside your house – don’t be constrained by things like opening hours. One of my favourite things to do is to go for a walk when all the shops, attractions and pubs are shut and there’s nobody about, just to appreciate the silence and emptiness and tranquility. Everything looks different at that time of day. 10. Use your free time (that was previously used to acquire more items) to strengthen your relationships with friends, family and other loved ones. I love the ideal behind the concept of minimalism, I thought it meant buying plastic angular tables etc. Now I know I can keep my stuffies, because at the end of the day, this is another one of those journeys you can embark on, and it starts with a single step (but has to be followed by a bunch of other steps, otherwise you’ve just stepped around in your own comfort zone). Minimalism for one person might be a toothbrush and a pair of jeans, whereas for another person it could be a wardrobe full of designer dresses. As long as the items are getting used, fulfilling you and not getting in your way when you want to do things or experience life, your minimalism can be as… minimal as you like. Personally, I’m trying to clear the house out. I want to know how few items I can live with. I will keep you posted as I go. It’s definitely helping that I’m now 40% fruitarian, because that simplifies cooking and eating by a long amount. I’m not getting rid of any cosmetics because I clear out the unwanted ones regularly and they are very important to me because cosmetics. Since they’re only taking up two drawers, and throwing out a couple of eyeliners won’t bring cosmic harmony to my life, I’m keeping the lot. 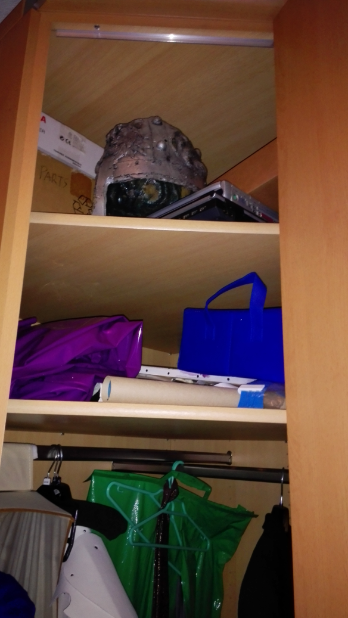 It’s the bigger, more insidious clutter – the stuff I don’t see every day but have to wade around whenever I want something from a certain room. 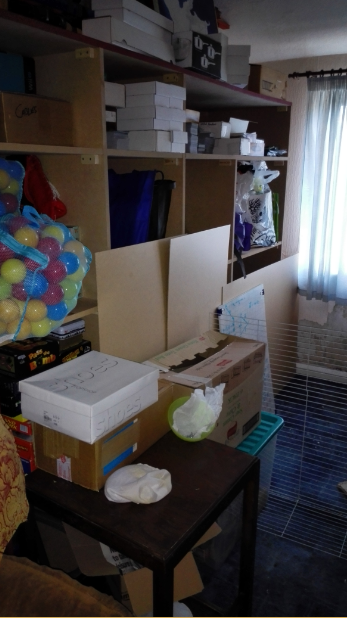 There are two rooms in our house where you have to rearrange stacks of clutter to get to the windows. That’s the sort of clutter I’m talking about. The main challenge I’m facing is that I’m married, and while my partner agrees that we need to declutter, I don’t think he is as willing as I am to let go of large items of furniture or larger quantities of books (we have over 1000 books), a lot of which he brought into the house. For the longest time I thought this was acceptable (because changing other people is bad, right?) but recently I reached critical mass. There was a bunny emergency, and I had to wait ten minutes to get to the source of the problem because of clutter. I lost my temper. 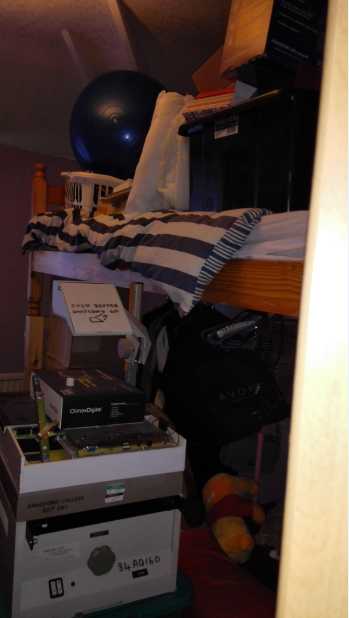 The next day, I realised that actually, I was to blame for all this clutter. Sure, my partner brought it into the house, but I was the one letting this cycle perpetuate by saying nothing and acting like this situation was okay when it really wasn’t. 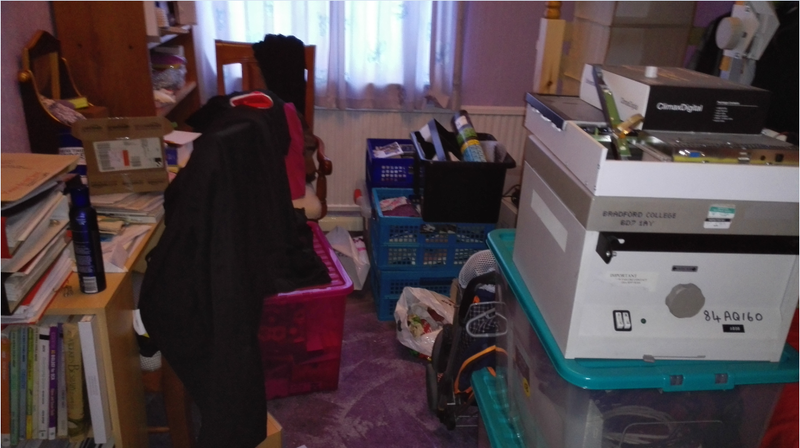 Then I had a huge wake up call – I’m the hoarder! I’m the one who can’t get rid of things! And at the same time (like many children of hoarders) I am a clutterphobe. I simultaneously hate clutter and have difficulty getting rid of things. I force myself to make decisions and get rid of large quantities of things, out of a fear of people finding out that I hoard things, but then I bring more crap into the house because I’ve never fessed up to my problem and haven’t admitted to myself that I need to address the root cause. Only, I’ve found the place where me and things go together. Oh, so many things. Too many things. Unnecessary things. And now I need to ask myself what will happen if I get rid of all these things. Do I need coloured candles, a relic of the 15 years I was a Pagan? No! I’ve moved on. Do I need the archaeology books I bought during undergrad? I was keeping them in case I did a Master’s. Will I ever refer to them again, even if I do a Master’s? Probably not, I graduated six years ago. I’ve moved on. Every item I was scared of letting go of related to a time in the past that I’ve now moved on from. It was as if I thought having the possessions would bring back the time. As an archaeologist, it’s what underpins our entire discipline – artefacts from the past = our concept of the past. And books, for those written histories. That was when I realised it was time to let go of it all. I’d already moved on – I was trying to, anyway – and needed my physical plane of existence to catch up with where my head was at, so I didn’t get lost in the past. It felt like such a big revelation. I never liked museums anyway – why would I want to live in one? It’s why I didn’t have a career in anything archaeological, because it all seemed to start with museums. I feel like I’ve been living in an alternate reality for a long time, that I need to wake up from now. I need to let go. There’s nothing to be afraid of in the empty space. Yup that goes to the ceiling. That’s all gone already in week one! 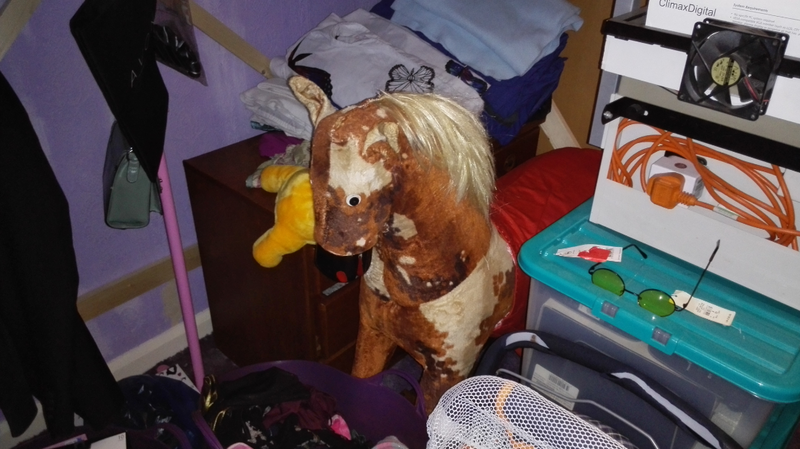 Yep, that’s a rocking horse. 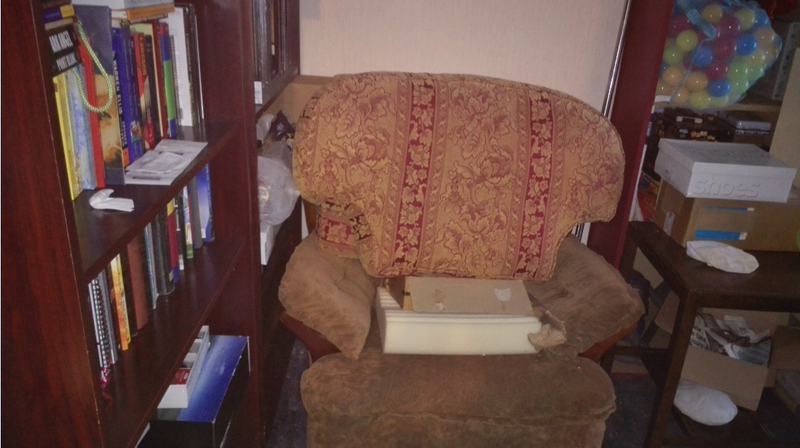 You can’t sit on this chair because of all those cushions – which came from a chair we no longer have!! That is another upstairs window we couldn’t get to if there was a fire. How did you guess?? I still have those hangers to deal with (and more) because I have to finish all the laundry to make sure every item has a hanger before I donate the others. Have you made the transition to becoming a minimalist? Do you find it has helped you achieve your goals? Are you scared of making such a big change to your life? Let me know in the comments. Next Next post: How much are those first editions REALLY worth? ?